Buy Acuvue Oasys contact lens at a specially discounted price. 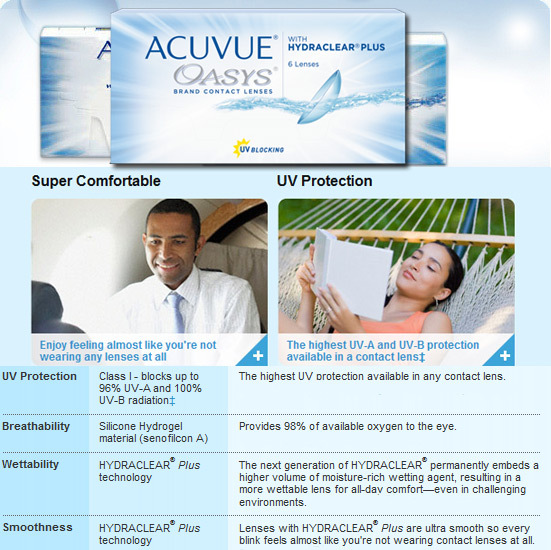 ACUVUE® OASYS™ are the next generation in silicone hydrogel technology designed for superior comfort, even in dry, demanding environments such as computer work, air-conditioned offices, aeroplane travel and daily commuting. They contain HYDRACLEAR™ Plus technology that creates a more wettable, ultra smooth contact lens especially for when your eyes need to be up to the challenge. ACUVUE® OASYS™ contains HYDRACLEAR™ Plus technology HYDRACLEAR™ Plus is the brand name for the next generation of our proprietary technology that allows us to use a higher volume of moisture rich wetting agent in a state of the art formulation. This creates a more wettable, ultra smooth contact lens especially for challenging environments that make eyes feel dry.